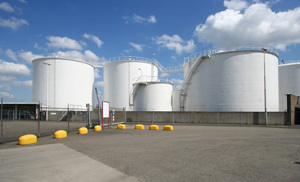 Bulk storage is typically regulated and separated into two types; aboveground storage tanks (ASTs) and underground storage tanks (USTs). These storage vessels typically require permits or registrations for construction or operation. Usually, the driving factors with respect to requirements are the size of the vessel and the material stored. In addition to specific AST or UST authorizations, the facility may also require these vessels to be addressed in air and water authorizations for the facility. Regulatory requirements associated with ASTs and USTs vary greatly by State. In certain instances a State environmental agency is responsible for such authorizations, while in others it is a Fire Marshall, County Building Department or no specific requirements may exist. It is imperative that a site’s specific requirements be determined early on to ensure appropriate design and installation of storage equipment (vessels) as cost overruns and project delays can severely hinder a project. Knowing what requirements exist for your application is important so that proper materials (i.e. : double-walled tanks and piping, secondary containment or interstitial monitoring) can be incorporated at the right time. Once you have installed bulk storage vessels, it is important that you understand the operational requirements associated with the equipment. RTP is well versed in AST and UST requirements and can help you understand the applicable environmental requirements. RTP’s diverse knowledge will also facilitate compliance under a number of other programs that may be triggered as a result of bulk storage changes including, but not limited to, air and water permitting, Risk Management Plans (RMP), Stormwater Pollution Prevention Plans, Spill Prevention Control and Countermeasure (SPCC) Plans, and Process Safety Management (PSM). It is critical to a successful environmental compliance program that these requirements be considered and satisfied as part of a bulk storage project. RTP can assist you with developing the appropriate list of environmental requirements and assuring compliance with applicable rules and regulations.